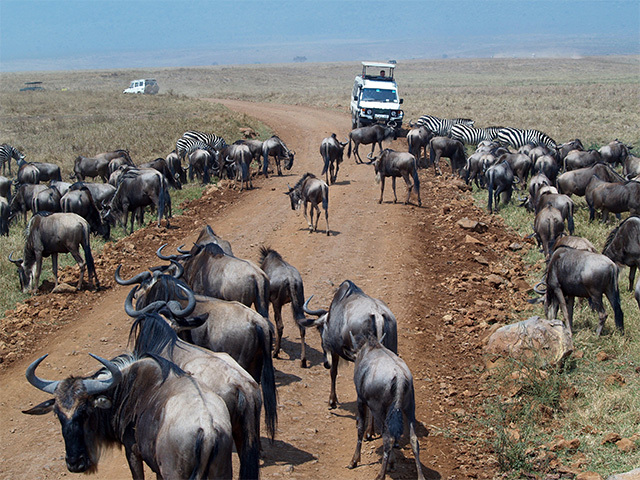 This expert-led Great Wildebeest Migration tour takes you through Kenya and Tanzania. Explore Serengeti, Amboseli & Masai Mara on extensive game drives to watch the migration in progress. Led by Hanne Lindeman, the tour gives you the best opportunity to witness the migration this September. Your Great Wildebeest Migration safari begins on arrival at Jomo Kenyatta International Airport, where you will be met by our representative and transferred to your hotel. The rest of the day is free to explore Nairobi on your own. Stanley Hotel has a spacious foyer, with its patterned marble floors, chesterfields, old clocks and ancient photographs all come together to transport you to another era. The Hotel has 217 guest rooms over eight floors in different categories including Heritage Suites, Executive Suites and Club Rooms. Dining facilities include the legendary Thorn Tree Cafe, Thai Chi Restaurant which has been awarded as the most authentic Thai restaurant in East Africa, Exchange Bar which was once the venue for Nairobi's first stock exchange, Pool Deck Restaurant and 24 hour In-room Dining. The heated pool on the 5th floor adjoins a fully equipped health club with gym, steam, sauna and massage facilities. After breakfast drive for four and a half hours to Amboseli National Park. Arrive in time for lunch at the luxurious Amboseli Serena Safari Lodge. Enjoy an afternoon’s game drive before returning to the Lodge for dinner. Amboseli National Park is famous for being the best place in Africa to get close to free-ranging elephants and for its breathtaking views of Mt Kilimanjaro. Secluded within a grove of acacia trees, Amboseli Serena Safari Lodge looks out over the golden savannah plains, with uninterrupted views of Mt Kilimanjaro. The lodge's décor reflects the brilliant primary colors and iconic shapes representing the legendary Maasai warriors. At the heart of the lodge, shaded by palm trees, is a free-form swimming pool with rooms on either side. Each room is housed in a single story building opening directly on to the grounds, reflecting a Maasai manyatta theme, each with its own hand-painted wall frescos. A timbered bridge over a melt-water stream takes you to the central dining area, while the lounge and bar feature a broad terrace and a blazing fire-pit where evening cocktails can be enjoyed. Spend the entire day on safari in Amboseli National Park, which is an International Biosphere Reserve featuring the dried-out lakebed of prehistoric Lake Amboseli, rolling savannah, and lush green swamps. Herds of elephant wallow in the emerald green swamps, half submerged in the papyrus grasses. The permanent marshlands also draw hippos and buffaloes, while offering a haven for the abundant water birds. The plains offer numerous antelopes, spotted hyenas, jackals, warthogs, olive baboons, vervet monkeys, and the chance of spotting a lion, leopard, or cheetah. Observation Hill, a conical peak, which is easily climbed, offers stunning views of Mount Kilimanjaro. Lunch and dinner will be served at the Lodge, whose grounds also offer the opportunity of an optional bird watching nature walk (150 species in the grounds alone). After breakfast, drive (total drive time: five hours) to the border town of Namanga where you will clear customs and immigration formalities for entry into Tanzania. Drive to Arusha, where lunch is served in a local restaurant. After lunch drive to the Ngorongoro Crater Conservation Area and check into the Ngorongoro Serena Safari Lodge, which stands on the rim of the ancient Ngorongoro crater, the largest perfect volcanic caldera in the world. A unique biosphere, the Ngorongoro Crater Conservation Area shelters some 25,000 large mammals dominated by bull elephants, rhinos and lions. 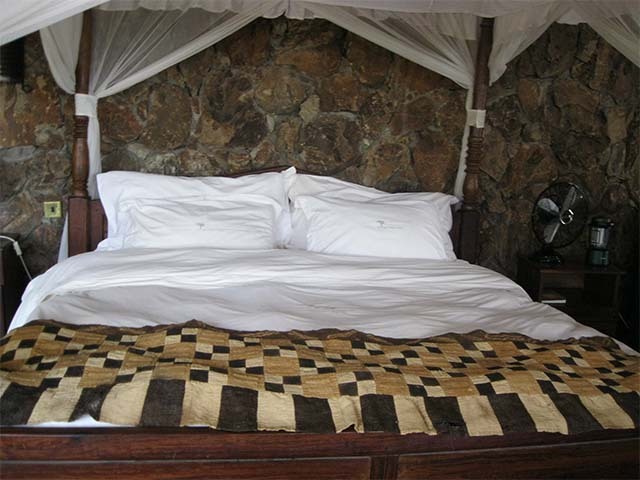 Ngorongoro Serena Safari Lodge is built from local river stone and camouflaged with indigenous vines. Designed to blend completely into the landscape, it is entirely invisible from the floor of the Crater 600 meters below. Linked by arched stone passages and timbered decks, its walls are decorated with stylized prehistoric cave paintings and lit by flaring torches. At the stone heart of the lodge, burns a glowing fire, which is kept constantly alight. Decorated with cave paintings, the rooms are strung around the Crater rim. Each has its own rock- enclosed balcony, and all enjoy completely uninterrupted views of the volcanic amphitheater far below. After breakfast descend into Ngorongoro Crater for a half-day tour with picnic lunch. Often referred to as ‘the eighth wonder of the world’, the Ngorongoro Crater is one of Africa’s best-known wildlife arenas. A World Heritage Site, it is also one of the largest volcanic craters in the world (almost 20 kilometers wide, 610-760 meters deep and covering a total area of 264 square kilometers). An utterly unique biosphere, the Crater harbors grasslands, swamps, forests, saltpans, a fresh water lake and a variety of birdlife, all enclosed within its towering walls. Due to its high concentration of wildlife, close-range viewing opportunities and striking scenery, it is Tanzania’s most visited destination. Leaving the crater, drive for three hours to the Serengeti National Park stopping en route at Olduvai Gorge, the ‘Cradle of Mankind’ and one of the most famous Palaeolithic sites in the world. The site is known for British archaeologists Louis and Mary Leakey’s renowned archaeological discoveries. Their findings include some of the man’s earliest known ancestral remains. Arrive at the Serengeti Serena Safari Lodge late in the afternoon. Set high on the saddle of tree-clad ridge commanding panoramic views across the endless plains of the Serengeti, the Lodge draws its inspiration from the circular ‘Rondavel’ dwellings and winding paths of a traditional Maasai village. Below the Lodge, is a sky-blue pool, and a hilltop vantage point to view the world famous annual ‘migration’. 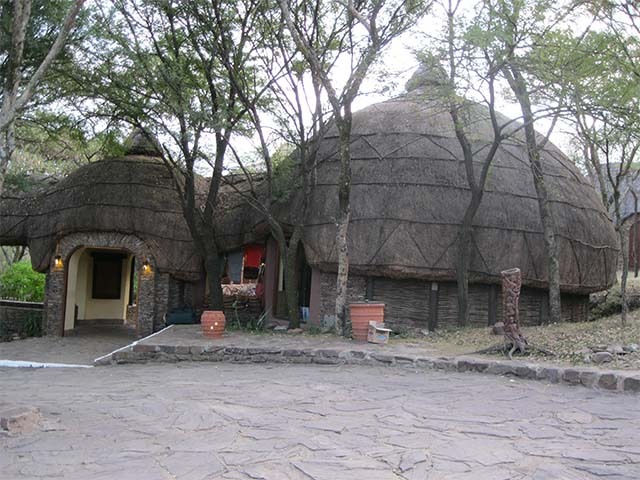 Each charmingly presented room is accommodated in a two storey stone-built thatched ‘Rondavel’. Each room has its own private balcony, private entrance, spacious bedroom, natural stone bathroom and intricately carved furniture. Spend the day on safari in Serengeti National Park with morning and afternoon game drives and all meals at the Lodge. The vast and sensational Serengeti, covering 14,763 sq km of endlessly rolling savannah plains, is Tanzania’s first-established, largest and most famous park wherein tens of thousands of hoofed animals roam in a constant and unremitting search for the fresh grasslands upon which their survival depends. 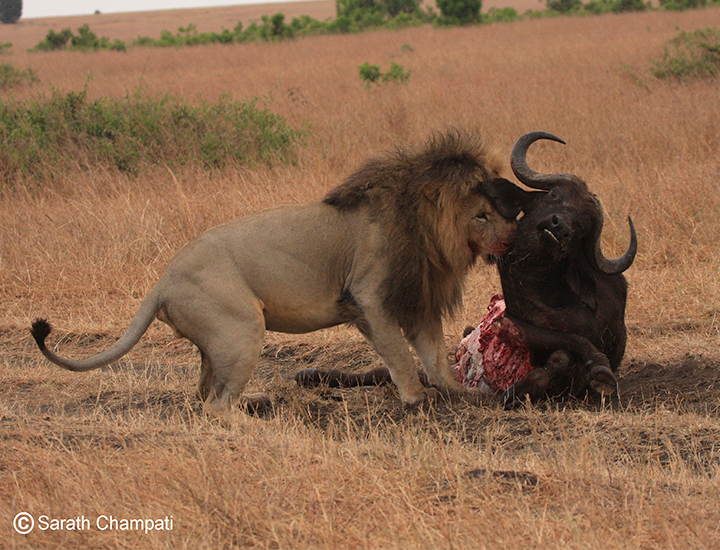 The million-plus wildebeest are the predominant herbivore and also the main prey of a huge cast of large carnivores, principally lions and hyenas. Whilst the annual migration is the Serengeti’s most famous attraction, the Park is also renowned for its lions, and additionally for its wealth of cheetahs, zebras, giraffes, Thomson’s and Grant’s gazelles, elands, impalas, klipspringers, hippos and warthogs. After breakfast, go on a game drive through the vast Serengeti National Park to Mbalageti Serengeti, which is situated in the western corridor of the Park, in the heart of ‘big game’ country (total drive time: two and a half hours). The Lodge offers a breathtaking 360-degree panorama view of the Serengeti Plain lands and the Mbalageti River, from where you can see the Migration. Go on a game drive into the Park after checking in. After breakfast drive to the Tanzanian border, complete immigration formalities and change vehicles for your onward journey to the Masai Mara National Reserve (with a picnic lunch en route), you will check in to the Mara Serena Safari Lodge, which stands high on a hill with spectacular views of the river and plains (total drive time: seven hours). World renowned for the breathtaking spectacle of ‘the greatest wildlife show on earth’, the awe inspiring annual migration of the wildebeest, the Mara is Kenya’s most visited protected area. Technically an extension of Tanzania’s renowned Serengeti National Park. The Mara constitutes only 4% of the entire Serengeti ecosystem but its rolling grasslands, meandering rivers and towering escarpments offer one of the world’s most rewarding and evocative wildlife arenas. Located at the very center of the famous ‘Mara Triangle’ of the world-renowned Masai Mara National Reserve, the Mara Serena Safari Lodge is the ultimate safari destination. Styled to echo the circular motif of a traditional Maasai manyatta, the lodge features twin rows of individual rooms, each with its own view of the famous Mara River. The central bar, swimming pool and dining areas enjoy spectacular views. Each room is accommodated in its own stand-alone modular unit, with uninterrupted views, private balcony and spacious seating area. Spend the next three days game driving across Masai Mara National Reserve. Historically teaming with wildlife, the Mara is famous for the large herds of elephant and buffalo that meander its plains; also for the pods of hippo that wallow in its mud-brown rivers. Other stars include the distinctive Masai giraffe, plum-coloured topi, Coke’s hartebeest, Grant’s and Thomson’s gazelle, zebra, impala, Kirk’s dik-dik, bushbuck, waterbuck, and red duiker. The Reserve also hosts Nile crocodiles, monitor lizards, baboons, vervet, blue and red-tailed monkeys, nocturnal bush babies, and tree hyraxes. After breakfast, drive for two and a half hours to Nairobi in time for lunch at the famous Carnivore Restaurant which is rated as one of the top 500 restaurants in the world. After lunch, check-in to Stanley Hotel and spend the afternoon either relaxing by the rooftop pool or seeing the city sights. Your Africa migration holiday ends after breakfast as you transfer to Jomo Kenyatta International Airport for your journey home. Hanne Lindeman is a wildlife biologist who has worked in African wildlife conservation and tourism for the past 30 years. Committed to the fact that ‘wildlife should benefit the local people’, Hanne has 12 years experience in wildlife management and conservation in South Africa and is the advisor to an ongoing rhino-monitoring program in Palansberg National Park. Offering an unusually extensive knowledge of Africa’s wildlife, natural reserves, culture and people, Hanne also excels both in sharing her knowledge and making the entire safari experience come alive for the members of her group.